At least one of you guessed what my new favorite ingredient is. It’s the thing that makes matriciana (aka a’matriciana) go from yum to oh, wow. I think I’m probably the last one to find this out. 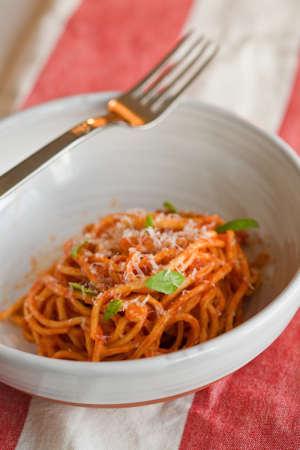 Mario Batali even has a great recipe up on his website that includes it. But, for some reason, I always thought that matriciana was made with thickly cut pancetta. It turns out, it really should be made with guanciale. 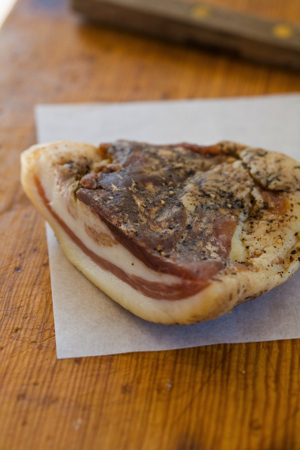 Guanciale is the dried meat that comes from pigs jowl rather than its belly. It’s meatier, saltier and I think that it holds up better in the sauce, becoming just a tiny bit gelatenous, but in a very pleasing way… sort of like perfectly cooked pasta has a bite to it. Finding guanciale may take a bit of work. If you are in Seattle, it’s easy. Just head down to Delaurenti and pick up some of Armandino Batali’s locally made stuff. If you aren’t in Seattle, you can order it online. (While you are there, I highly recommend getting some of the mole salami. yum). 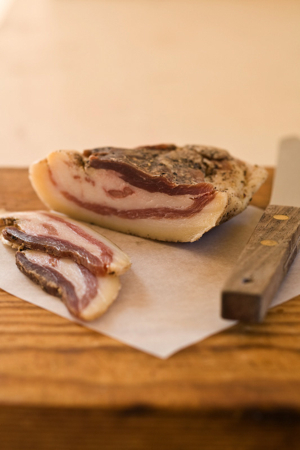 If you are particularly excited about guanciale though, try making your own! I plan on it, and in fact, ordered a copy of Michael Ruhlman’s Charcuterie book as soon as I got home from Italy. Batali also has a recipe online. Unlike many cured meats, it only takes about a month. This particular recipe originates from a taverna in Rome, Renato e Luisa, via the Gambero Rozzo (the Slow Food guy apparently, I’ve learned not the Slow Food guy, Gambero Rosso, although the name is deceptively similar.) cookbook that I picked up in Italy. The cookbook is all in Italian, and my Italian translation skills are pretty minimal (or non existant without babelfish), but I’ve managed to do a rough translation of the recipe. There seems to be some controversy over the origins of the dish as well. Many claim that it is is from a small town in Lazio, Amatrice, which would certainly make sense. 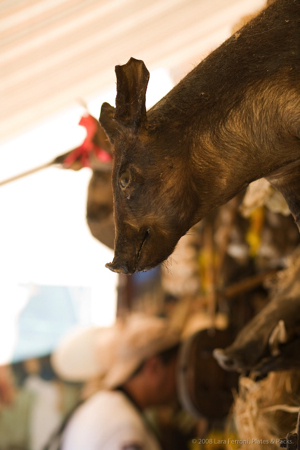 However, others also claim the sauce is Roman (onions seem to be the dividing factor there…), citing that the word has its root in words from matraccio (a vessel to hold tomatoes), matriarcato (matricarchy) or even that the word matrice (matrix) was used to mean pig jowl. The one thing that everyone agrees on? Use guanciale. Place a large pot of water on the stovetop to boil. While that is heating, lightly fry the guanciale with a little olive oil and a whole clove of garlic. Add the red onions, and cook until the guanciale has released its fat. When it is well browned, add the crushed red pepper and the tomato sauce. Lower the heat and cook very slowly, letting the color of the tomato change from red nearly orange. Then, add the grated pecorino. Remove the pan from the heat, and take out the clove of garlic. Taste the sauce, and season with salt as needed. It is important to taste because the amount of salt in the guanciale can vary greatly, and you don’t want an over-salted sauce. Add salt to the now boiling water, and add your pasta, stirring to prevent sticking. Cook until the pasta has softened, but is still al dente, or firm to the tooth, and then drain. Place the warm pasta in a large serving bowl. Slowly pour in the sauce and stir together to lightly coat the pasta (you may not use all your sauce). Lightly dust with grated parmesan, some fresh basil leaves and a thread of olive oil to serve. Manfricoli is a pasta by many names. You may find it referred to as umbrichetti, cordelle, ciriole, strangozzi, or my favorite, strozzapreti (priest strangler). The noodles look like thick, slightly rough, squared spaghetti. The pasta can be made with our without eggs (sometimes called manfricoli bianco), a sign of the relative lack of affluence in Umbria. These days, making the pasta without eggs is a symbol of pride… the pasta tastes just as delicious to me without them, particularly when paired with the matriciana sauce. Finding a recipe for the homemade pasta is tricky. Some use semolina, some don’t. Some add salt, others leave it out. How long you knead it always seems to come down to “when it is done.” One thing is certain… you’ll need to find some Italian “00” flour if you want to come close to the texture of real Italian pasta. You can find it at Italian specialty shops, or online here, here and here. I’ve found with a bit of experimenting, I’ve developed a recipe that I like. It’s not quite as beautiful as the stuff from the pasta fresca shop in Narni we could pick up for just a couple of euro, but it will do. Stir together the flours and salt into a large mixing bowl. If you have a mixer with a dough attachment, you can use that bowl. If not, make sure the bowl is large enough to really move the dough around in. Make a well in the center of the flour, building up the sides just a bit. Add about a ½ cup of lukewarm water, and lightly stir with a fork, pulling just a little flour at a time in. When that has become a paste surrounded by more flour, add a bit more water, about ¼ cup at a time, continuing to stir with the fork, until about half of the flour has been incorporated. Then, either using your hands or using the mixer, pull in the rest of the flour, to form a dough ball. If the dough seems too dry, add a bit more water (while continuing to knead) at about 1 tablespoon at a time. If it seems too sticky, add more all purpose flour, 1 tablespoon at a time. Keep kneading until the dough has become soft and smooth. It should not be sticky… it should feel like soft skin. I find that even with the mixer, I like to hand knead the dough near the end to make sure I have the right consistency. Cover and let rest for about an hour. Cut off small rounds, and run through a pasta machine, starting on the widest setting. Run the dough through once, fold it in half, and then run it through again, seam side down at the same thickness setting. Repeat this process on the widest setting until the dough seems fairly workable, and it is getting squared off. Then, narrow the setting on your machine, and run it through again twice without folding. Narrow one more time, and run it through one last time. Place the dough sheet on a floured surface and proceed with the next piece of dough. To cut the manfricoli, you can either cut each piece by hand, or use the spaghetti cutter on the pasta machine. The pieces should be fairly narrow, so that they become almost square. Dust the cut pieces in semolina flour to help keep them separated and try not to pile them on top of each other. If they clump some, don’t worry about it too much… they should separate when boiled with the salt water. It’s best to use the pasta within 30 minutes of cutting it. This entry was posted in Dinners, Food, Recipe, Savory, Tips, Travel. Bookmark the permalink. Its 10pm, and I am now hungry again. Thanks for that! That pork jowl looks awesome. I nearly braised one a few months ago, but this looks even better. YUM. Michael Ruhlman’s Charcuterie book is awesome I have to say. Tons of recipes, and of course incredibly in-depth processes. I love it. I LOVE Matriciana. Definitely one of my favorite pasta dishes, and it’s the guanciale that makes it so good. I’ve never tried it with Manfricoli though…this might have to be the first recipe I try with my pasta maker. Thanks for the detailed recipe! Sigrid – oh! Thank you so much for the correction on that book. I assumed that it was a variation in spelling and was the same person. That must frustrate you (and Gambero Rosso) to no end. The recipe, however, in this case I think is a good one. On the origins of the recipe, there are lots of debates over that from what I understand… but that’s probably worth noting in the write-up. So I’ve made all the corrections! Thanks again! This looks truly delicious. In New York, we can get guanciale in chelsea market at the italian shop. LOL! I love the “before” and “after” pictures. Nice post. 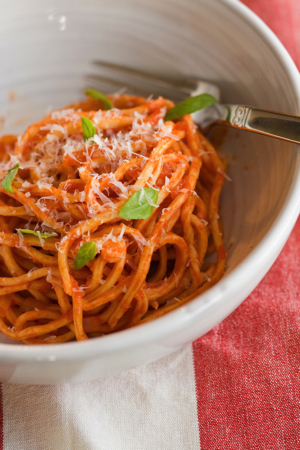 actually, to tell the truth, the original Amatriciana recipe doesn’t include any onion nor garlin. it’s a very simple recipe, basically all about guanciale, tomatoes, extra vergin olive oil and grated pecorino cheese. I personally like it with a little red onion too, but never tell it to a traditional roman cook! Actually Gambero Rozzo is a guide about “trattoria” which are usually more familiar based/traditional/not so expensive places as restaurants(rozzo means somethin not very refined/classy/elegant and it’s similar to rosso (which is “red”…gambero rosso means “red shrimp)), so gambero rozzo is a good guide for these kind of places. Funny that! I just received two blocks of meat from a friend in Italy. One looks incredibly similar to the guanciale photographed here. Thanks for the recipe, which will come incredibly handy now! So it IS guanciale! I am happy for you that you can find it in the States as well. As to Gambero Rosso vs. Rozzo (both are not persons, rather publishing houses): I have them both and like them both as well. As Michele said above, Rozzo is for simpler, more “true to the origin, home-maker type” trattorie. You just need to know their approach & stance and then can use both guides appropriately. You definitely made a yummy dish!